ABC is making more moves to cement itself as a leader in dramas. The network just ordered six new dramas for the 2015-2016 television season, and Shondaland’s The Catch is one of them. ABC recently greenlit six new shows, all dramas, for the upcoming 2015-2016 season. Of those shows, a new one from Shondaland—Shonda Rhimes’ production company—called The Catch looks to be the standout. This will be the fifth Shondaland show on ABC, following in the footsteps of ratings juggernauts: Grey’s Anatomy, Private Practice, Scandal and How to Get Away with Murder. One thing is clear, ABC and Shondaland have a good thing going, and the momentum is likely to continue. According to Variety, The Catch centers on a fraud investigator, Alice, who suddenly finds herself in the middle of a fraud investigation orchestrated by her fiancé. In between her own cases, Alice has to find her perpetrator before the fraud investigation ruins her career. Jennifer Schuur wrote the script for The Catch and serves as executive producer alongside Shonda Rhimes, Betsy Beers (Rhimes’ longtime business partner) and Julie Ann Robinson. Like Shondaland’s previous ABC shows, The Catch features a female protagonist who is undoubtedly at the top of her game in her profession. Although it was written Schuur, with the plot in mind it sounds like Shondaland material. The enduring medical drama, Grey’s Anatomy, was the first Shondaland show to debut on ABC back in 2005. Since then, Shondaland has ushered in hit after hit, all dramas, putting ABC at the top of the list for dramatic programming. Private Practice, a Grey’s Anatomy spinoff which also happened to be a medical drama, was the second Shondaland show on ABC, followed by the political drama Scandal and just this year the debut of the first non-Shonda Rhimes created Shondaland show for ABC, the legal drama How to Get Away with Murder. In addition to ordering Shondaland’s The Catch, here's a look at the other upcoming dramas. 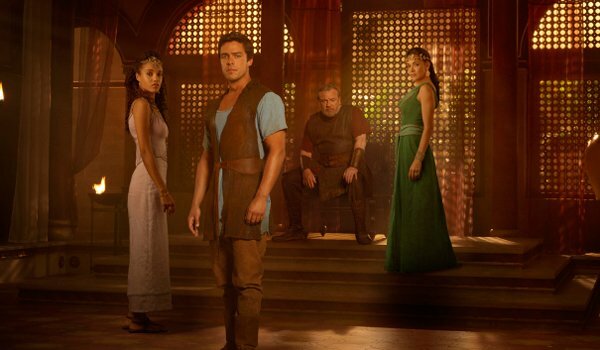 Of Kings & Prophets features a Biblical saga told through the eyes of a king, a prophet and a shepherd all intertwined by destiny. Quantico centers on a diverse group of Quantico recruits, one of whom is suspected of masterminding a mass-casualty attack on New York City. Up next is the Untitled Pate & Fishburne Project, which revolves around two working class guys who move to North Dakota after an oil boom, only to find themselves in a rivalry with ruthless tycoon. The Family revolves around a politician’s young son who mysteriously returns home after being presumed dead for a decade, sparking great suspicions about his identity. Lastly, Wicked City will feature a different case from a noteworthy era in L.A. history, starting with a case murder from 1982 and revolving around rock and roll on the Sunset Strip. Along with the slew of renewals ABC announced last night, the 2015-2016 TV season is looking pretty good for ABC. Photo Credit Courtesy of ABC.